Energic tracteur Dynastar electrical system. Energic introduced the new Dynastar electrical system in the mid 1950’s as an up grade on the 500 series (especially the 511 mark 1) for ease of starting, lighting and conformity for road use. It was ideal for on farm use as well, as it offered a electrical system that powered light front and back there extending the use to the night for these early tracteurs. 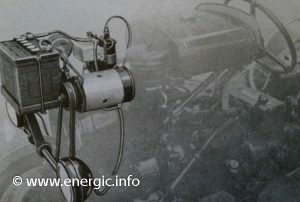 This system cost extra, and was a factory ordered on the first Energic 500 series 511’s petrol. Front lights – side, dip and full. Rear lights – brake, side and main. Plug/socket rear on the left hand wing, suitable for powering external light, or electrical fitment for remorques etc.